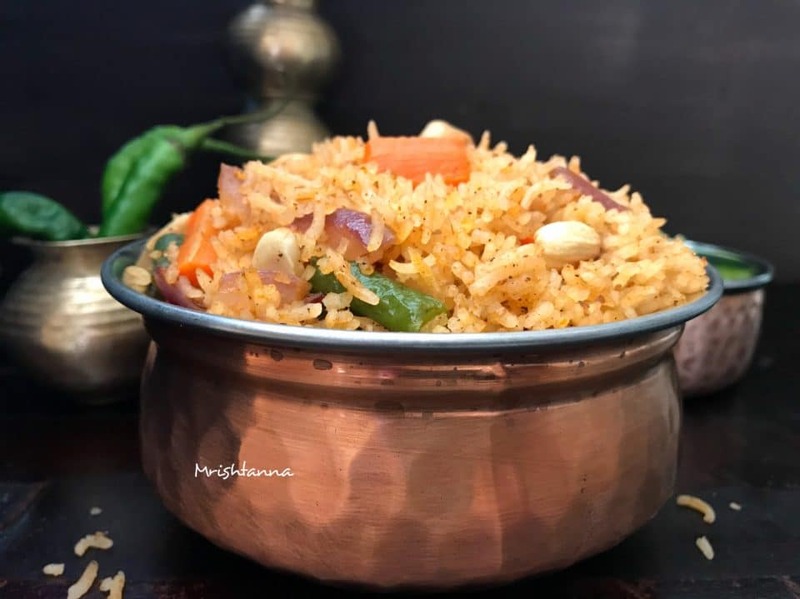 Instant Pot Vegetable Rice or Pulao! Today, I have an announcement to make along with a recipe for a time-tested, fan favorite Indian dish prepared in an easy way. The announcement is that I have added a new gadget in my kitchen that could cut my cooking time in half! 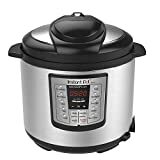 It’s the new Instant Pot! 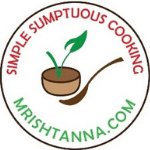 I have been getting requests for recipes that can be prepared with the Instant Pot, for some time and I decided to start with a dish that is quite popular in almost all Indian restaurants. That is Vegetable Rice. 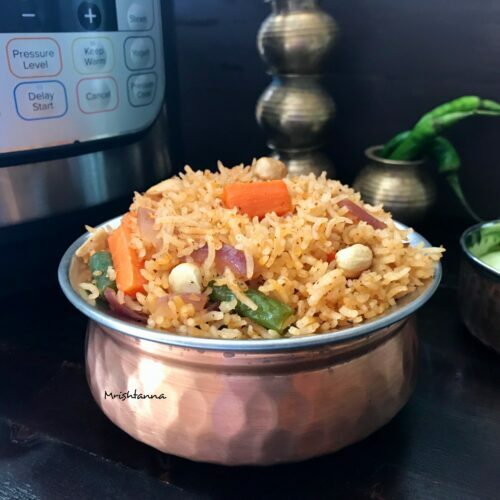 Let’s look at finer details of cooking with an instant pot to make a quick, easy and delicious vegetable rice dish or pulao. This dish is very common in every Indian house. There are few different methods of preparing pulao or vegetable rice. 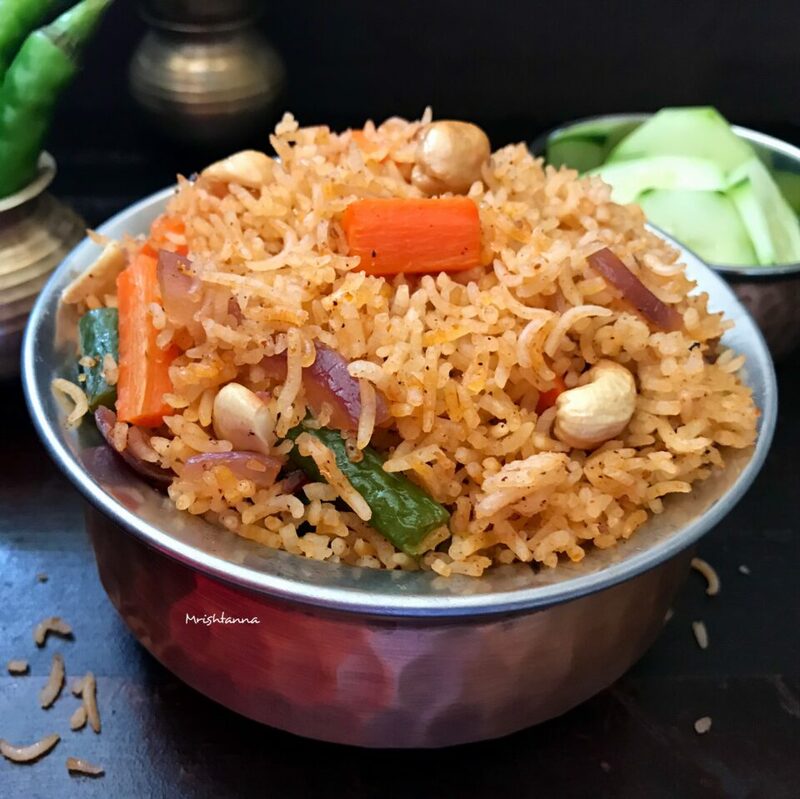 I am sharing a simple vegetable rice recipe that goes well with lunch box as well as weekday dinner. To begin with, I soaked basmati rice for nearly 15 minutes and then drained them. I set it for 4 minutes of cook time in the manual mode. The recommended ratio of rice and water is 1:1, but I went with a little extra water to make up for the vegetables that I added. That is pretty much the only customization you will need in preparing inf this recipe. 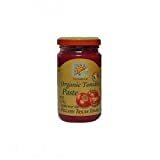 Since you are adding vegetables, there is a small chance that the pot will show a “burn” sign at the end of the cooking cycle, but this is not a reason to panic. All you would have to do is turn it off and wait for the pressure to come down on its own and the lid will release naturally. My dish turned out beautifully and I am sure yours will too! With fewer dishes to wash, the instant pot has really made our lives easier. The best and quick vegetable rice made in Instant Pot. Drizzle the oil to the inner pot. With the saute setting, saute ginger and garlic when the oil is hot, for about a minute with constant stirring. Add onions and continue to cook for one more minute. Add all the spices listed above and continue to stir. Add cashew paste and stir well. Now, add rice and water as listed in the ingredients list and stir well to get an even mix. At the end of 10 minutes, open the lid and remove the pot from the cradle. Vegetable rice is ready to be served with your favorite side dish. Hi Carol, It’s spice called cloves. Thank you! Sounds delicious, a pressure cooker seems like such a convenient way of cooking rice! I love cooking in the Instant Pot! 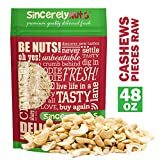 I’m adding this recipe to my list to make! This rice looks so flavorful! I really need to buy and instant pot, and I love your hammered copper dish. Thank you Linda:) Even I waited for long time to buy Instant Pot:) Now I am in love with this Pot. I need to use my Instant Pot more often! I know what we are making next in our pressure cooker! Great! Love to hear your feedback:) Thank you Jasmine. Love this one Uma, shall give a try. It looks awesome. So I just printed recipe and forgot to soak rice so please add that to instructions in recipe! I found that even after the four minutes and quick release the vegetables were overcooked! I did have burn message on IP so opened to avoid further burning. Saute seemed too hot and it was difficult to avoid all the herbs sticking in the pot.